Chadwell Springs Family Golf Centre is the perfect escape for golfing pros and first time hitters alike. With Pitch & Putt, Driving Range, exciting Footgolf and a 9 hole course there is something for all abilities and all ages. It’s outdoors fun, fresh air and green spaces across 48 acres of grass landscape every day of the week. The place to improve the golfer’s swing or simply to hit a bucket of balls and relieve some stress. Chadwell hosts 17 floodlit bays, 2 studio bays for one on one coaching sessions, robot ball collectors and multi distance range targets to aim for. What better way to start playing golf than a round at our pitch & putt short course. Featuring holes from 56-94 yards in length, the strategically positioned bunkers will be perfect for even the most advance golfers whilst providing a non intimidating learning ground for newcomers to the sport. Maximum of 4 players. Suitable for both young ones and grown ups. Why not play our pitch & putt course with your feet! We’ve carefully installed an extra hole next to the green to fit a size 5 football. The goal is to get a football into the hole in the fewest number of shots possible. A game for up to 5 players. Power & precision are king here to win but if you just want a kick about with friends and family footgolf at Chadwell Springs is perfect for it. The origins of footgolf are uncertain, one thing we do know is that we love it and salute the UK Footgolf Association for making it a thing. Our 1000+ yards Par 3 course boasts a challenging 9 hole course. The perfect leap from our short course, our Par 3 hosts a more undulating design and some testing bunkers. Maximum of 4 players per group. Whilst playing don’t forget to enjoy the panoramic view of Hertfordshire’s King’s Mead nature reserve. We are not too strict on dress code, all we ask is to show good etiquette and behaviour and be respectful to other players on and around the course. Please wear golf shoes or trainers, bring your own set of clubs each and accompany 12yr old players and younger at all times. Whilst of course we don’t expect the same dress code and rules awareness as a private members golf club, we want to maintain both a fun and safe environment. Knowledge of basic rules and etiquette at least should be adhered to and up-most respect of fellow golfers should be given at all times. Sensible footwear recommended includes trainers, plimsolls and golf shoes. Golf clubs will be available to hire on pitch and putt should you not have your own and we expect them to be well looked after during the course of your round. Lastly please avoid slow play at all times and if necessary let faster players ‘play through’. Max players par 3/ pitch putt golf x4. Max foot golf players x5. Bring your own clubs or hire at £1 per club, £5 deposit per club. Club hire is available on a first come, first served basis. Lights out at 9pm weekdays, 7:30pm weekends! Be rewarded with 15% extra balls every time you play our driving range! Visit our Pro Golf Shop and sign up to receive your card. To activate the card you will require to top-up with a minimum £30 credit. Credit valid for 18 months. Bring your own clubs or hire at £1 per club, £5 deposit per club. Club hire is available on a first come, first served basis. Open 364 days a year, weather permitting! Visiting as a spectator? Grab a comfy seat at our venue pub & restaurant The King’s Mead and enjoy a few nibbly bits whilst you wait for your loved one. To book a table in advance visit the pub website. Ware rail station receives trains from Hertford East and London Liverpool Street with connections from Broxbourne via Cambridge and Bishop’s Stortford. You can access Chadwell Springs within 15 minutes walking distance from Ware station or grab a taxi outside the station if carrying golf clubs. You’ll find Chadwell Springs between Ware and Hertford in Hertfordshire. M25 Junction 25 (A10) follow signs to Cambridge. From A10 going North. Come off A10 at Hertford Junction and follow signpost to Gallows Hill (3rd Exit) follow road until you see the school on your right, take the next right into Hertford Road at a small roundabout. Continue for 1 mile approximately and Chadwell Springs is on the right hand side just past a small industrial are and next to pub The King’s Mead. Free parking is available on site for players and pub guests. Stretching your legs before a golf session? Cyclists and walking ramblers can make use of the Riverside Trail alongside River Lea with access to Ware Road and Hertford Road, leading you to your final destination of Chadwell Springs. Free cycle spaces are available on site for players and pub guests. If travelling with your bicycle via train you may wish to check any restrictions via Greater Anglia in advance. Check here. Chadwell Springs golf club site formerly known as East Herts Golf Club (1899) sits on what was originally Lime Kilm Farm. Family brewers McMullen & Sons have operated Chadwell Springs since 1974. The land is formed over chalk caves – it is the water in these caves that to this day is used in the brew of McMullen’s local ales. To create unforgettable experiences at Chadwell Springs, a brand new golf shop and public house have been opened at the newly developed family golf centre. The redevelopment of Chadwell means golfing facilities improve as well as its landscape, planning habitat creation over 1.2 hectares in size and planting over 2,000 trees. drop a message and say hi! Do you want first dibs on golfing offers and events at Chadwell Springs? Sign up to our newsletter mailing list today! We’ll email you from time to time and look forward to seeing you soon. By Opting into our Priority Club, you consent to receive email and SMS communications and offers from McMullen and Son’s Ltd. venues that we feel you may be interested in. Would you also like to sign up to receive offers and news from The Kings Mead pub? 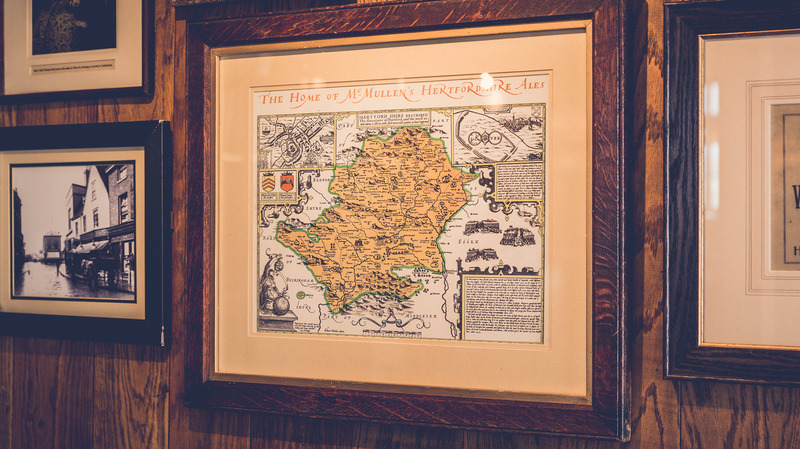 Visit The King’s Mead, our neighbour pub for seriously relaxed dining and a great selection of thirst quenchers – the perfect pit stop for spectators and golfers! Gift vouchers can be used at Chadwell Springs for all activities and at over 80 McMullen pubs & bars for food & drink. Perfect for every occasion! Order online now.